Next Tuesday (February 3, 2009) will be 節分 (Setsubun). I wrote a little bit about it on my site’s FAQ page. (Click here to read it). 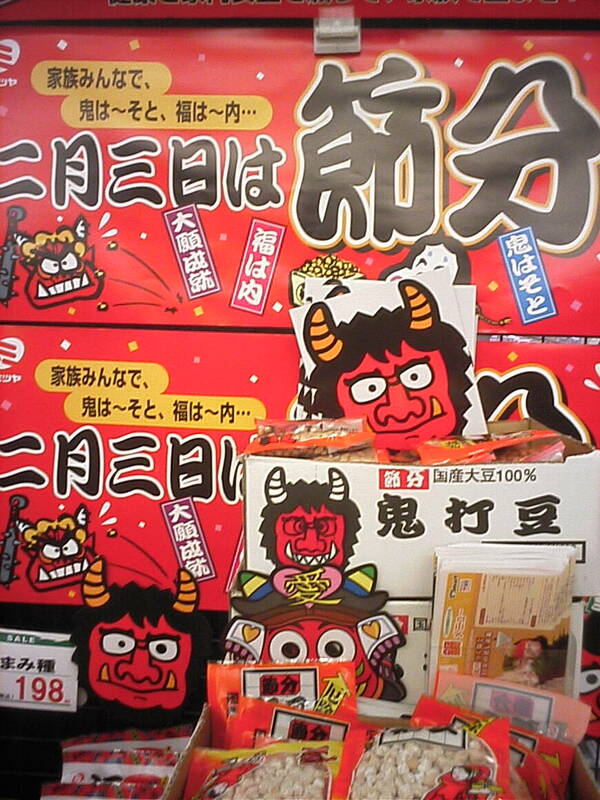 You can buy 節分 (Setsubun) beans and 鬼 (demon) masks at stores in Japan this time of year. On this holiday, the father in homes with children wears the demon mask (it’s not a scary demon) and the children throw the beans at him while shouting 「鬼は外、福は内!」 (“Out with the bad luck, in with the good!” (lit. “Demon out, Fortune in!”)). Setsubun sets at a store in Tokyo. After the kids throw the beans, the 鬼 (demon) runs away. The children have banished bad luck from the home for the year! Then everyone in the family picks the beans off the floor and eats them (floors in Japanese homes are clean because noone wears shoes indoors). You’re supposed to eat the number of beans that corresponds to your age. Another thing that is popular on 節分 (Setsubun) is to visit a major temple (for example, 浅草寺 (Sensou-ji Temple) in 浅草 (Asakusa, Tokyo)) for their 節分 (Setsubun) event. If you have a chance, you should see it. I have to work on Tuesday, so I can’t go…but I’ve been to 節分 (Setsubun) events many times. At these events, a famous sumo wrestler or celebrity who was born in the same Chinese zodiac sign as the current year will throw 節分 (Setsubun) beans at the crowd. February 11 is 建国記念日 (National Foundation Day). 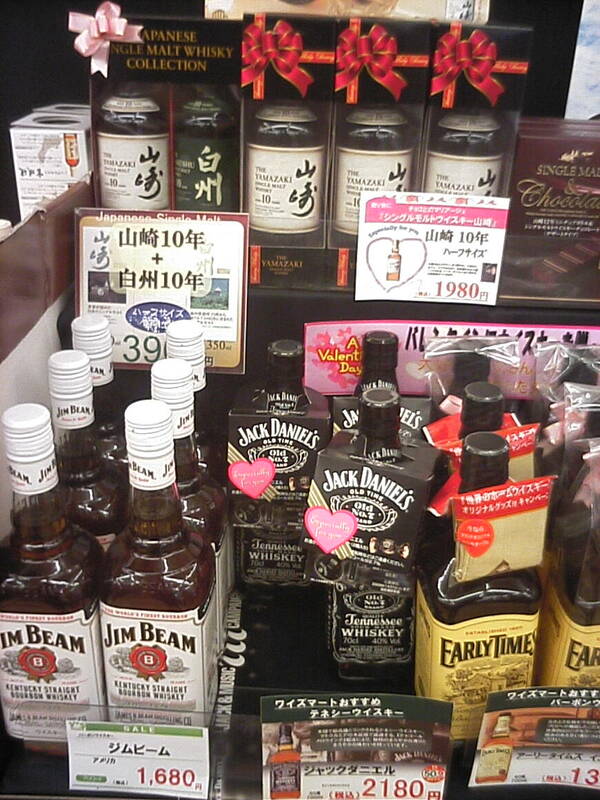 Just as it is in Western countries, February 14 is 「バレンタイン・デー」 (Valentine’s Day). But it’s celebrated differently here. In Western countries, men give chocolate or gifts to women on 「バレンタイン・デー」 (Valentine’s Day)…but in Japan, women give chocolate to men on this day. Not just any chocolate. And not just one man. She makes homemade chocolate for her boyfriend (or husband and sons), and also gives 義理チョコ (Obligation Chocolate) to male co-workers, boss, brother-in-law, etc. Then one month later, on March 14, it’s 「ホワイト・デー」 (White Day). This day is closer to Western-style Valentine’s Day, because men give chocolate or gifts to every women who gave them chocolate on Valentine’s Day. The most expensive for his girlfriend (or wife and daughters). A store's Valentine gifts for young kids. The Valentines gift that I want! Well, this year, Japan’s biggest chocolate company, 「森永」 (Morinaga), is offering a series of chocolates this 「バレンタイン・デー」 (Valentine’s Day) aimed at couples who would like to do 「バレンタイン・デー」 (Valentine’s Day) the “Western style” (men give chocolate to women). They packaged these chocolates with all the writing backwards because that’s what Western-style 「バレンタイン・デー」 (Valentine’s Day) is in Japan. Backwards. All of the writing is backwards. 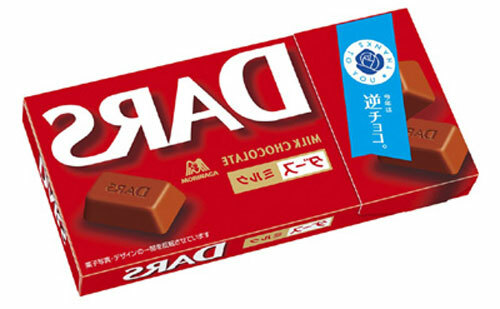 "Morinaga"'s line-up of 「逆チョコ」 ("Reverse Chocolates"). Last year, the Japan Tourism Board tried a “Yokoso! Japan Weeks” campaign to lure visitors to Japan…and I guess it worked, because right now until February 28, 2009 is “Yokoso! Japan Weeks 2009“. During this campaign, there are many specials and sales to help foreign visitors enjoy Japan. If you plan to visit Japan, the official “Yokoso! Japan Weeks 2009” website has information that will be helpful. And if you visit during by February 28, 2009, there’s a coupon on the site that you can print out and use a stores listed on the website. (Click here to visit the official “Yokoso! Japan Weeks 2009” website). Also, if you’re planning to visit Japan (or you’re already here), and you have any questions…feel free to ask me via comment on this blog (or Email) and I’ll try to help. Maybe you know… Why is it that beans terrify those ogres? The first known severe allergy perhaps? It’s just a silly questions I always ask that stumps all the Japanese people I ask, I’m sure there is an answer buried deep down there…. It may even have cultural significance. I’d speculate that it’s simply because beans are something children can toss in the house and then eat off of the (clean) floor. > everything goes well with beer, doesn’t it? Did you eat Korean food? It’s spicy. >HAHAHA some people here in Brazil would probably be offended to have beans thrown at. It’s an old Japanese tradition. >I’ve tried was some kind of a good luck soap you eat at the first day of the year. In Japan? No one eats soap in Japan. I wonder if you mean mochi…Japanese people eat mochi at 正月 (New Years) and I suppose it kinda looks a little like soap. Yes, but many holidays have become commercialized…including Valentines Day, Mothers Day, Xmas, etc. HAHAHA some people here in Brazil would probably be offended to have beans thrown at. But the bad luck good luck thing sounds nice, All I’ve tried was some kind of a good luck soap you eat at the first day of the year. Japan and Korea are quite different, aren’t they? You live in Hawaii. There are many Japanese people there. And many people can speak Japanese language…when Japanese tourists visit Hawaii, they don’t need to know English! Yes, David and I spent 6 days in Seoul in 2002. Loved every minute of it. >Too bad Foundation Day is on a Wednesday and the Thurs and Fri aren’t holidays as well. When I came to Japan, holidays like 「成人の日」 (Adults Day), 「体育の日」 (Health Day), etc weren’t always on a Monday like they are now. If they fell on Saturday, and you didn’t have to work Saturdays…it was a lost holiday. (If they fell on a Sunday, it would be celebrated the next day, though). So, we get alot more holidays nowadays. Actually, this year (2009), there’s gonna two “Golden Weeks“! The regular one in May (May 3-6)…and then Sept 20-23, 2009 are holidays because 「系統の日」 (“Respect For The Aged Day”) is on the 3rd Monday in September…which will be Sept 21 this year. And 「秋分の日」 (“Autumn Equinox”) is on Sept 23. So since Sept 20 is Sunday, Sept 21 is a holiday and so is Sept 23…they made Tuesday, Sept 22 a “filler” holiday! So, Feb 11 being a holiday on a Wednesday isn’t a big deal…we’re getting plenty of holidays. And, have a day-off in the middle of the week is a nice break, actually! If you have any questions about Japan, I hope that I can help. >Wow. Women buy the MEN gifts. Yes, but men have to reciprocate a month later at “White Day”. >does your wife have a sister? Thanks for visiting my site. Please comment anytime! >My husband and I spent 3 nights and 1 day in Tokyo last June and enjoyed it tremendously. I’m glad you enjoyed your visit…I think Tokyo is the best city in the world! I noticed on your site that you’re “Korean-American”….did you visit Korea too? Too bad Foundation Day is on a Wednesday and the Thurs and Fri aren’t holidays as well. Yup, great information for sure, especially if you have just started living in Japan like me (I am getting your 20 years of wisdom living here). Wow. Women buy the MEN gifts. T5…does your wife have a sister? I found your blog via Jeffrey’s. My husband and I spent 3 nights and 1 day in Tokyo last June and enjoyed it tremendously. Loved the fresh sashimi and sushi! 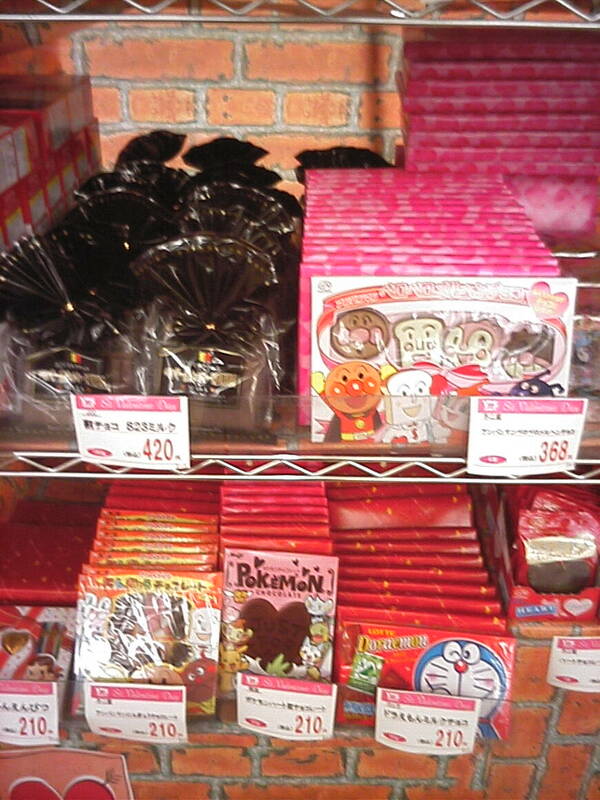 Yes, everything is quite different in Japan from America…even things like Valentines Day which were imported from America are done Japanese-style. Once again tokyo5, this is great information. especially about Valentine’s Day.